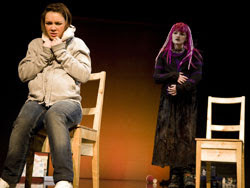 Vivian French's play, based on her own novel, presented the audience at Cumbernauld Theatre with two fifteen year old mothers from clashing cliques within a school who find a common bond in their unintended pregnancies. "Baby Baby" isn't quite the challenging or perception altering play it wants to be, but it is a wonderfully stylish piece of theatre with two hugely impressive performances. Cleverly structured and told in flashback Ashley Smith's pink haired goth Pinkie and Hannah Donaldson's label clad April tell their intertwined stories. In addition to voicing their own characters they each portray a multitude of characters that feature in the other's tale and both give hugely impressive performances in bringing them to life. French's dialogue for the teenagers rings true but there aren't enough moments of humour to significantly raise the entertainment level. Indeed, many of the show's best moments are unspoken. Jemima Levick's direction keeps things interesting, Jane Howie's movement set pieces are delightful and Philip Pinsky's soundtrack is superb, but oddly the show seems simultaneously too long and too short. While never dragging, at just over an hour it felt closer to ninety minutes, yet it ended while it seemed it still had plenty of places to go. We don't get any real sense of the difficulties the future holds for the characters or more than passing references to the fathers. And although I'm not unsympathetic to the seemingly central message that these girls made a mistake, and that we all make mistakes, I'd have liked there to have been an appreciation of the cost that mistake (and in fairness, the way society responds to it) will have on the baby. It's not that the play makes things seem too easy - it doesn't, but it does take a distinctly short term look at it. Thanks largely to the accomplished performances and a clear stylistic vision for the piece, Stellar Quines and Perissology Theatre Productions have put together something that has definitely put them on our 'watch list'. Baby Baby has been on an extensive tour of Scotland which it completes this week in Aberdeen, Kirkcaldy and Castle Douglas.